I am writing to let you know about my whereabouts over the next few weeks. 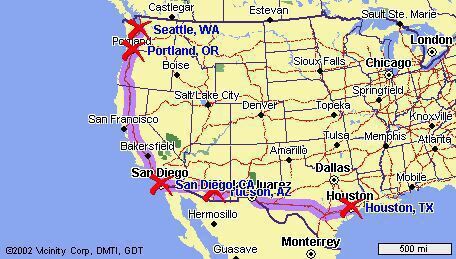 I am going on a motorcycle trip that will take me from Texas to Washington in a period of three weeks. The trip starts in Houston, TX (map enclosed) and it will take a place in two legs. 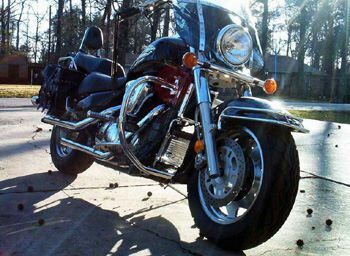 On Sun Feb 2nd 2003 in Houston TX, I will pick up a 00 black&chrome Suzuki LC 1500 that I bought (see the photo below), load it with necessary stuff and drive into a sunset. I plan to spend a night in Austin, TX. Next day (Mon, Feb 3) hopefully reach El Paso, TX, and then end the first leg on Tue Feb 4 in Tucson, AZ (while making a stop in Tombstone, AZ. Wouldnt miss OK coral place for millions). In Tucson, AZ Ill remain for 2 weeks, working on a horse ranch, riding and training horses, and on Tue Feb 18 Ill head west toward CA coast, making a stop in Yuma, AZ (famous prison), trying to reach San Diego by nightfall. The next day, Feb 19, Ill drive through Los Angeles, Santa Barbara, and overnight in Big Sur. Following morning, Feb 20 is San Francisco, Sonoma and Napa wine countries (hopefully visit the famous Grgich vineyard). Ill try to get as far north that afternoon as possible, for the next day (Feb 21) Ill have a long ride to Salem, OR (500+ miles). After spending a night in Salem, Ill arrive to my new home of Seattle, WA on Feb 22. The whole trip is 3,000 miles long and it involves riding long straight roads in the SW, windy 1 and 101 in CA and OR, and some major interstates. Ill be sleeping in a tent along the way. If anyone is interested in joining me on some of these legs, we can easily coordinate. I am hoping to have GPS, CB and a cell phone (+1 617 230 9277) on board.